Well today was my in-laws 51st wedding anniversary! Last year was the BIG one and they took the whole family on a 7-day Royal Carribean cruise over spring break last year. Anyway, this is the card I made for them this year. It uses PTI products........go figure!! 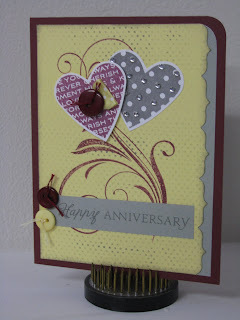 I started with Scarlet Jewel cardstock layered with Lemon Tart. 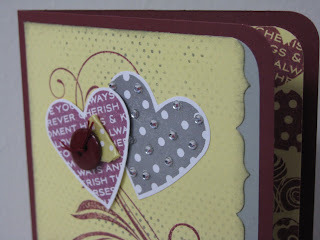 This layer was stamped using the latest polka dot set from PTI....Polka Dot Basics II. 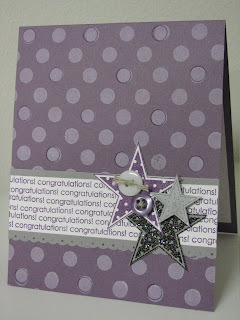 Then by stamping the largest flourish over the polka dots. I love the look!! What about those hearts? I dug out Heart Prints and simply punched them out with my heart punch! Did you notice one new thing I used on this card? Hint: in general, it's one of my favorite tools lately. Yep, you guessed it....... a border punch.......specifically......the Upper Crest Fiskars border punch! I finally got my hands on one and boy do I like it! It adds just enough elegance. The sentiment came from Heart Prints too. Here is a close up and it just shows how I stamped the inside of their card.......with a row of the smaller hearts that are included in Heart Prints too. Had to add some bling to the main heart with rhinestones that PTI is now carrying. I finally broke down and used some dotted Lemon Tart ribbon here too but just a snippet. I have been hoarding that stuff for a while now. So, what do you think? I would love to read your comments. Well, TAC has just released their NEW fall magalogue. There are 42 new stamp sets in there!! Here are all the publications shown together. If I do say so, there are some **SUPERB** samples in there!! 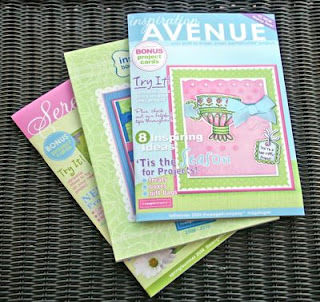 Several of my stamping friends got the chance to design for this publication!! I am trying to figure out who made what.....I can kind of tell from their styles which is which but it is so hard but fun! Well, if you would like a copy of this new publication, Please let me know!! :) Have a great weekend!! I wanted to share a card today that is one of my favorite cards I've made this summer. It was made for a lovely young woman (our niece) heading off to college at KSU (Torey that's you!). Well, you see.....she is totally a KU fan!! She thinks she will be able to wear KU attire at KSU and not get beat up!! NOT!! We even bought her a KSU t-shirt to wear so that she would "fit in"....hehe. Anyway, here the card I made her for her high school graduation. I conveniently left off the "wildcat" stamp but HAD to make it purple!! Go KSU!! Well, Torey moves into Clovia house on the KSU campus this week. Have a great time....these will be the best years of your life! I used several stamp sets here all of which are PTI. Just LOVE PTI!!!! Anyway, I used my Polka Dot Basics for the background in Fresh Snow ink and then went back over random dots with the outline portion in purple ink (I am trying to use my old SU inks....Eggplant Envy). 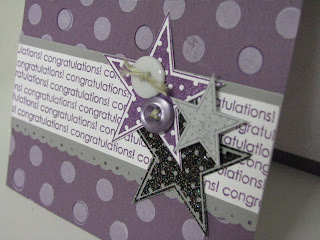 The congratulations border was created using Around and About Sentiments layered over grey carstock. Now, onto those FABULOUS stars!! They were made using Everyday Classics stamp set from PTI.....yep the one you get when you purchase **enough** stamp sets in the qualifying year. I am an addict, I admit. Back to the rest of this card. That black star was embossed with versamark and SU Bedazzled Black embossing powder. (from my stash a long time ago) And couldn't forget buttons and a EK Success border punch!! 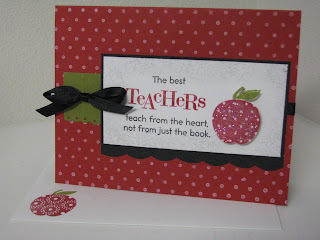 Anyway, I just love this card and it will be a great layout to make in other colors!! Let me know what you think.....and thanks for visiting!! Hello all.....I had time to play today!! So, I decided to take a stab at a challenge. My fellow stamp friend, Barb, has started some fun Halloween challenges on her ALL Halloween blog called Haunted Design House. Well, the first one is called Wicked Thicket. She said "use those pretty spring images and create a little darkness". It was a challenge, I tell ya!! I do like how it turned out!! Certainly wouldn't have used this "flowery" stamp set for Halloween!!! LOTS of sponging with several different colors to get that look on the green cardstock. I got out my shimmer spray for over the flowers......my spray pump stopped working so I just "splattered" it over the flowers and rubbed it in with my fingers. Oh yeah, you have to have jagged edges on a spooky card, right? Got out that old edge distresser and went to town and I didn't even care that the paper tore!! Added to the effect! Well, let me know what you think.....this was certainly "out of my comfort zone." Thanks for stopping by!! Well, the summer is winding down with only 2 weeks left. I enroll Brett in school for 2nd grade on Weds!! Where (literally) has the summer gone?? I have enjoyed the weather we've had this summer but I fear we're about to get the temps of a true Kansas summer this week! So, we will be going swimming a lot this week to take advantage of it. We plan on trying to make it Schlitterbahn up by the KS Speedway in Bonner Springs. This is a new outdoor water park that just opened it's 1st phase a couple of weekends ago. I'll certainly post here to let you know how our experience was! On to a project I made for Brett's teacher as the end of the year "thank you" last year. I REALLY like how this turned out. 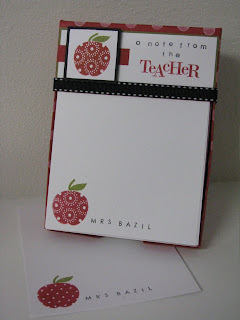 I again used a Timeless Template from PTI to make this stationery set as well as the Teacher's Apple stamp set. 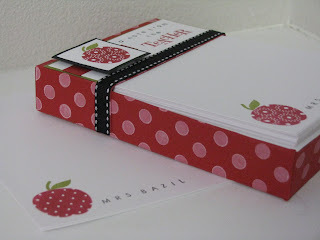 I included cardstock notecards and personalized them with her name. 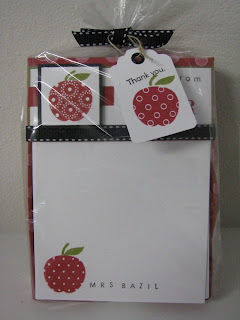 Each one I utilized a different apple stamp!! "go to" sets ever!! Can't wait to order Polka Dot Basics II set soon! These last pics are of the card I included with her personalized gift and how I packaged it. 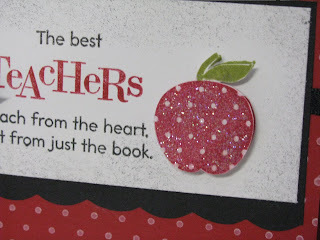 The apple is glittered using prisma glitter and raised with a pop dot. 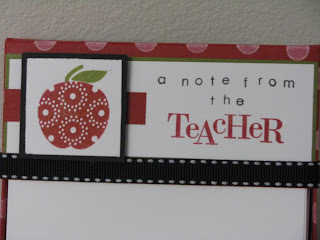 Well, I hope this project has inspired you to make that teacher this year a special gift to let them know just how much you appreciate them as your kids' teacher. Thanks for visiting! !